I love my generation. Really, I do. There’s so much potential we are just now tapping into. We created Facebook, file sharing, and the Shake Weight. We revolutionized where a video camera can go with the Go Pro. We are more connected than anyone ever. And we have a heart for social justice unlike past generations. If there is a generation that is going to change the world, for good or for bad, it’s going to be us. We are so. freaking. cynical. Maybe it’s because our first memories are of Clinton being impeached, the Enron scandal, and OJ being acquitted. Or maybe it’s because we really are more connected and find out information that didn’t come out in past generations. Whatever the root, the truth is that instead of looking through a lens of hope, we look for the negative before ever imagining a positive. A few weeks ago I posted a question on social media asking what the point of social media was. I had to delete the post within minutes because it became filled with so many negative comments that I didn’t want to be associated with it. Instead of recognizing the incredible power residing quite literally in our hands, the overwhelming consensus was that there is no point in social media and we just do it to do it. That’s the side of my generation I don’t like. That’s the side of my generation I refuse to be a part of. 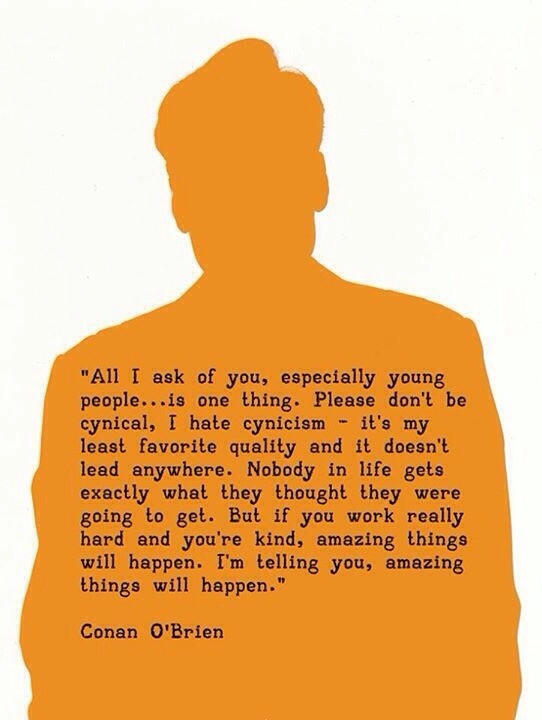 Conan O’Brien had a great quote on his final night as host of The Tonight Show. He asked our generation one thing: to not be cynical. He said it’s not a good quality to have and it doesn’t lead anywhere. Instead, he asked us to work really hard and be kind. Work really hard and be kind. When we work hard, we don’t have time to find the negatives. They get in the way of our work. Instead, we have to force ourselves to find the positives so we can keep moving forward. When we are kind, we can’t be mean. We can’t type up an emotionally charged message for all the world to see. Instead, we force ourselves to think of others first and put them ahead of ourselves. Cynicism strips us of our joy. It takes away our dreams and desires to make the world a better place. It replaces those with disinterest and depression. My grandma once pulled me aside and said, “Jonathan, I’m worried about you. You’re not smiling.” Last year, in the midst of my quasi-quarter life crisis, I realized I’d stopped smiling again. That led to a lot of time evaluating things and taking a look at my life. As part of that, I realized I had caught the bug: I had become cynical. It’s easy to do. A bad relationship here and a few hurtful things there and boom. Next thing you know, you’re questioning everything and down the path so many of my generation have taken. Determined to leave that path, to not be overtaken by cynicism, I realized a simple truth that guides much of how I operate today: it is impossible to be cynical when you’re smiling. Seriously. Try it. You can’t be negative with a smile on your face. You can’t be angry while laughing. It’s impossible to be cynical while smiling. I’ve chosen to rebel against the cynical nature of my generation. I invite you to do the same. This week, as you go to work, to school, or even to the grocery store, look for ways to make other people smile. Fight for a laugh. Be determined to do whatever it takes to lighten the mood and encourage the people around you. You’ve heard me say it before: I want to change the world. We do that by bringing hope, joy, and smiles. Cynicism has always been a apart of mankind. Its just finally become so easy and so quickly to respond and verbalize it. Less than a generation ago, we would be talking about that editorial on the Sentinel… “I going to write a letter to the editor…” But that took work. Effort. Only the serious and dedicated did that. Now, everyone has a twitter/Facebook/Instagram that whole world can see. And its considered cool in certain circles. We reward by simply responding, even if its to tell the guy to back off. I take 40 day Sabbaths from social media 2 to 3 times a year. If it wasn’t for convincing myself I needed it for leading/volunteering at church, I would DELETE ally accounts. But that sounds rather cynical, in a way, doesn’t it? What I would LOVE to see from your generation is that you control the technology that you ap proudly created. But unfortunately, what I see, like my most with a phone in their hand, it controls you.